Here are my textured nails for this weeks pick and mix challenge! I decided on the textured prompt for this week, the others are matte and the 60s. I use matte finish a lot (that might be cheating a bit) and my mind went completely blank at 60s lol! I managed to break the corners of my index and middle finger nails in a freak cooking accident so I ended up reshaping them… I have to say rounded nails are not for me! I keep thinking they look like spoons or paddles, my poor nails 😦 I think I’m just going to keep them well filed for the next few weeks until they grow back to a shape I like! This is two coats, I used Moyou Pro XL 04 for the image along with Konad Special Polish In Black. 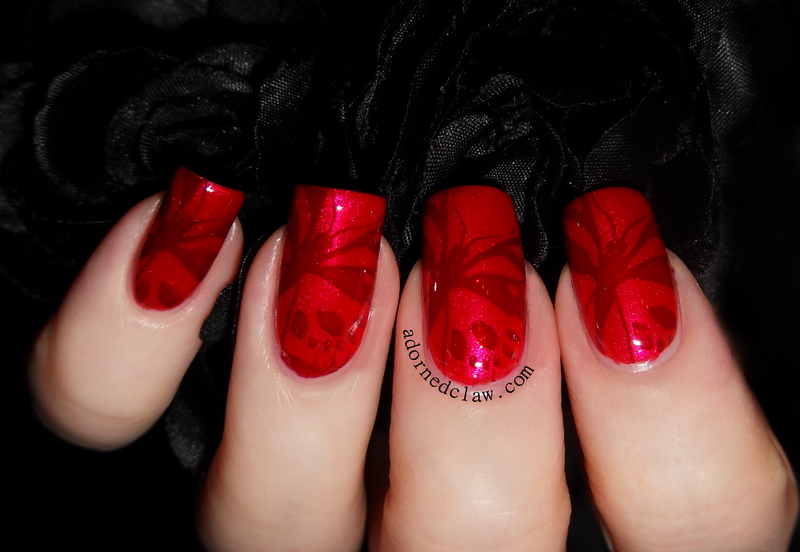 I have to say the Sugar Fix is an amazing base for stamping over! The zebra print is so sharp! Here are my half moon nails for day 18! Starting with a couple of coats of black magic, I stamped the bottom half of my nail, with Agiaia, I used Moyou Pro plate 05 which is a standard size plate from them, it’s way too narrow and short for me to use as a full nail, but it’s fine to use sideways for half a nail lol! Then I applied a thin coat of Seche Vite, when that was dry I used ring binder hole reinforcements to mask off the half moons, then sponged on some more Black Magic and removed the sticky rings. Then I applied another coat of Seche, waited for it to dry then stamped using the same image, but with Konad SP Black and then a final coat of SV. With all of the topcoat I used for this I’m honestly surprised that it didn’t shrink a lot more! Sorry it’s been so long since my last post, I have tried to write this a couple of times but my brain just hasn’t been cooperating lol! I have been super busy! I went to a music festival which was amazing and it was really lovely to catch up with people I don’t see very often. Did a big spring clean of the flat (which I really should finish at some point) and loads of gardening, I have loads of really interesting plants and I really hope they all grow! Here are my glittery nails for day 17. I used Shooting Star from Rimmel, it’s from the Space Dust collection and it’s a polish that I haven’t tried before, I have to say I think it would look better with some undies. I applied two coats but it didn’t seem to be quite opaque enough, but this doesn’t really show in the photos. When it was dry it has a slightly gritty texture so I added a coat of Seche Vite to make the stamping a little easier. 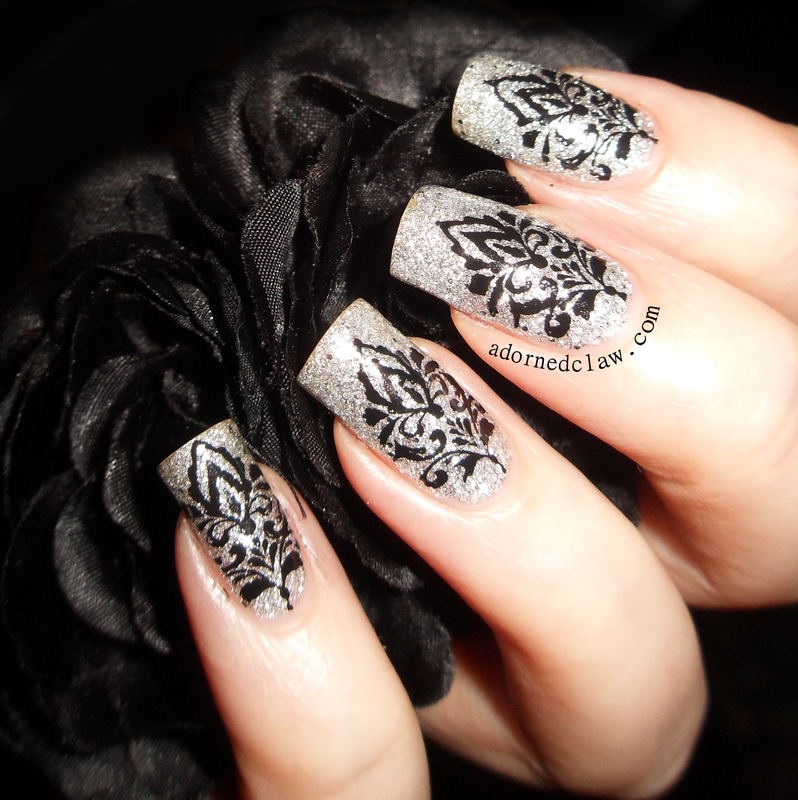 The black stamping polish is Konad SP in Black, then I applied another coat of Seche Vite. 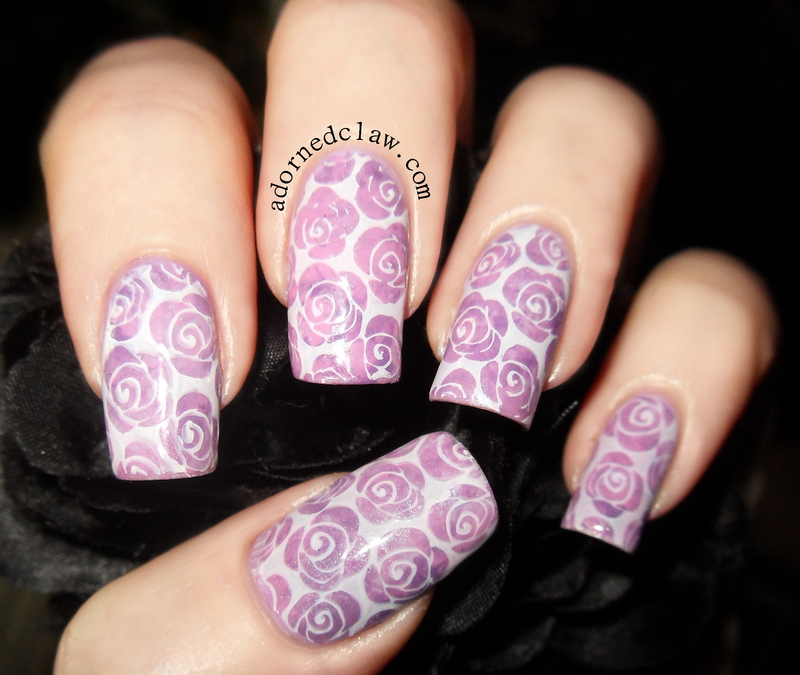 I’m thinking of investing in a XL squishy stamper, I have the Konad hard double ended (hehe) stamper and the white and purple rectangular ones from Messy Mansion, the rectangular ones are amazing! I love the purple one so much! My flowery nails for day 14! For a change I decided to stamp with white polish! I ended up with really pretty pale pinky/purple sparkly nails that looked like marble! For the stamping I used some more White On White with Pro collection 07 XL from Moyou. A little bit late, but here are my animal print nails for day 13! I have to say that this looks much better in real life! My nails look very washed out in these pictures. 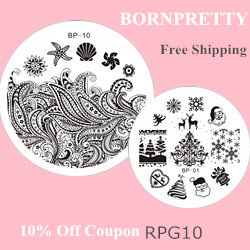 The stamping plate is Pro Collection XL 04 from Moyou. I used some more Shabby Drab along with a couple of drops of Artemis from 2True for the stamped images, It was quite difficult to see what I was doing with the gradient, the 2True polish sunk under the Color Club so I couldn’t tell how much purple I had picked up! 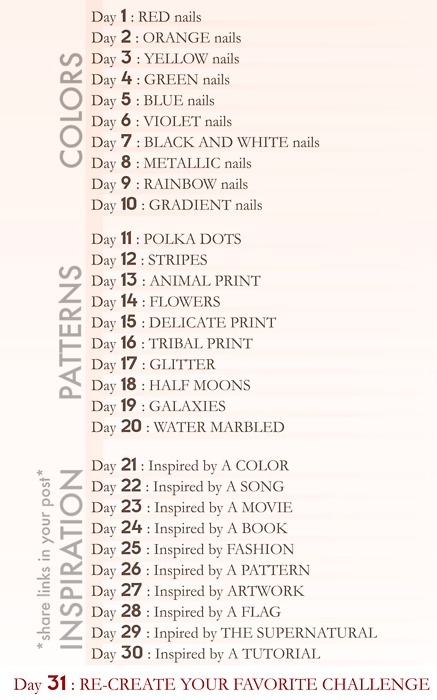 I am doing the 31 days of Colour nail art challenge! On top of the GOT polish challenge (I must be mad)! I started with a couple of coats of Ruby Stilletos from Sally Hansen. This is a really lovely polish, it’s a bright red with loads of red glitter! 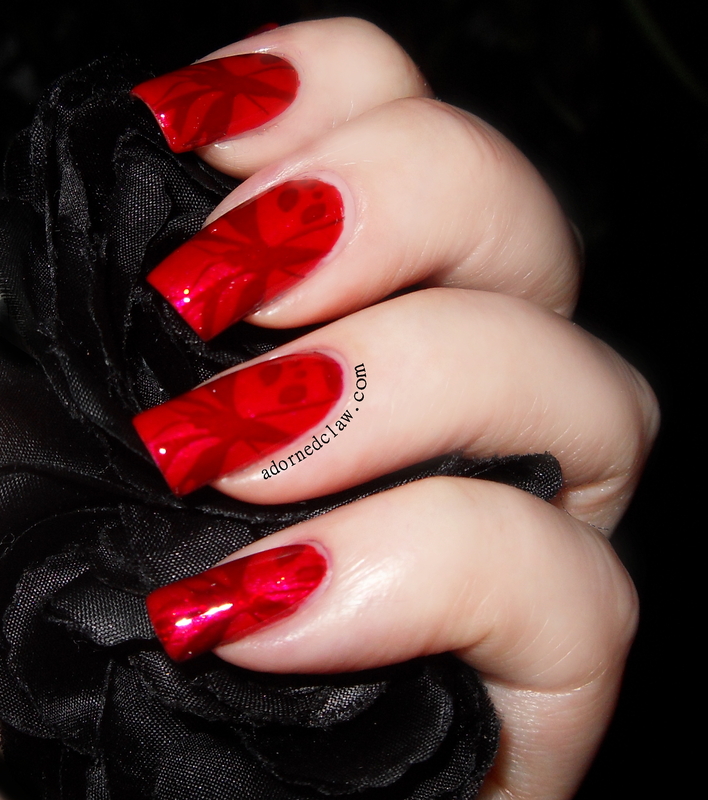 The butterflies are from Moyou stamping plate Pro Collection XL 05, using Rouge Noir from Chanel. Then finished it off with a coat of Color Club Topcoat. 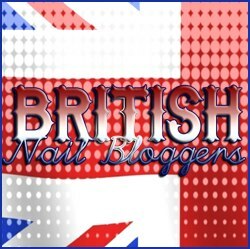 Hmmm what to do for tomorrow’s nails?….